Saturday afternoon at Prince Royal’s College on a balmy winter afternoon, ideal conditions for rugby, and Chiang Mai’s international team, the Suas (Tigers), took full advantage. Clicking into gear after a few games spent dusting off the cobwebs and getting to know each other’s names, the Tigers tore into a Maejo side which, despite having enjoyed some good results of late, had no answer to the power and size of their international counterparts. Well drilled, suitably skilled, taller and heavier than the Thai opposition, the Suas wasted no time in amassing an impressive points tally that effectively saw the game over by half-time. Gavin, a teenager vacationing in Chiang Mai, opened proceedings with a great try, an impressive debut score. More tries duly followed from Chris Hartley, while skipper Chris Jenkins and Luke Simon scored two apiece. The final score of 43-0 by no means flattered the victors, but it was a little harsh on a Maejo side who proved game competitors and were certainly up for the fight. At this point, and on a more solemn note, we must report that the game had to be abandoned early in the second half due to an injury to a member of the Maejo team, who was subsequently taken to hospital. The sincere best wishes of all involved go with the player, and we hope he recovers swiftly. The group stages of the tournament should conclude next Saturday, at the same time that this report goes to print. The Suas are expecting a much tougher match against the Prince Royal’s College, and we look forward to that with much anticipation. He ain’t heavy........Ronnie checks out the view of Doi Suthep. Chris Hartley, an experienced rugby player who even used to play professionally for Leeds Rhinos in England, was optimistic about the team’s chances of progressing to a final against the Barbarians, “We’re getting more disciplined all the time, and we’re learning how to support each other,” he enthused after the game, thoughtfully supping on his Tiger Beer. 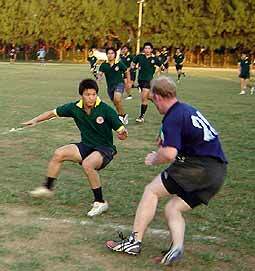 Chris is also involved in the wider push to develop rugby across Thailand at grassroots level, for example in schools. And even Thai girls are playing rugby now. Ronnie Levi is also supporting Thai rugby in Thailand, and emphasized that the momentum is now firmly established for the development of the game in our region. “Chiang Mai Suas are one year old”, he informed us, and proceeded to elaborate on how it took just three like-minded fans getting together last year to create what is now a burgeoning rugby union scene. 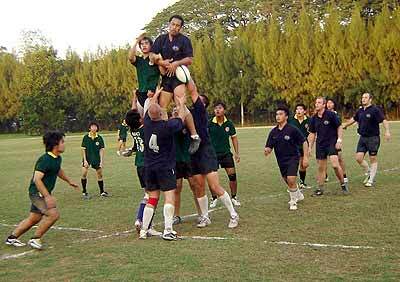 If you would like to be involved in the rugby scene, then Chiang Mai Suas are looking for more players. Please contact Ronnie at [email protected], or drop into the Irish Pub in the Old Town and have a word with Sandy. And finally a mention to the kind sponsors of the rugby tournament, Go Putt-Putt Crazy Golf. Their excellent crazy golf course can be found in Chiang Mai Business Park behind Carrefour supermarket, www.goputt-putt.com. Almost 800 bikers from 100 clubs throughout the country and more from overseas descended on Chiang Mai for Bike Week 2005, hosted for the fifth year by North Comets Club of Chiang Mai. Supporting this event were the Tourism Authority of Thailand, VVP Automobile BMW authorized dealer, Provincial Police Bureau Region 5 and Imperial Mae Ping Hotel. Presiding over the gathering were Juthaporn Ruang rom-asa, marketing department deputy governor of the TAT, and Pol. Lt. Gen. Panupong Singhara na Ayuthaya, commissioner of Provincial Police Bureau Region 5. Pol. 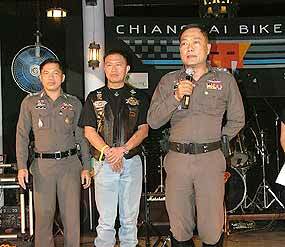 Lt. Gen. Panupong Singhara na Ayuthaya, commissioner of Provincial Police Bureau Region 5 (right) presided over Chiang Mai Bike Week and welcomed the bikers, joined with Pol. Col. Prayad Boonsri, Muang Chiang Mai Police Station superintendent and Supoj Wirapreechamet, president of North Comets Club (central). along with members from about 100 motorcycling clubs throughout Thailand there were bikers here from Malaysia, Singapore, Hong Kong, several European countries, and Scandinavia. Bikers had traveled to the North by riding along several routes and passing through provinces including Chiang Rai, Lamphun, Phrae, Nan, Phayao and Mae Hong Son. Meet The Locals - the defending Champions. 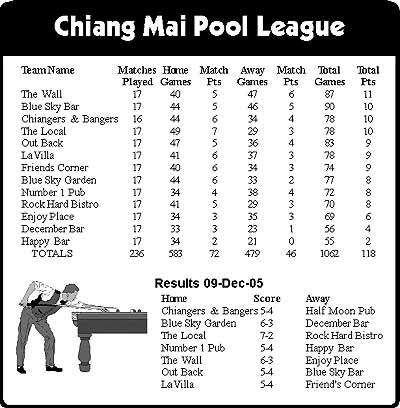 Last week’s Chiang Mai Pool League fixtures were disrupted by fire at Chiangers and Bangers. Blue Sky Bar went down at Out Back, The Wall marched on and The Local returned to true championship form. Meanwhile, Blue Sky Bar failed to close the gap on the leaders and dropped to third place after losing a tense, high-quality match at Out Back. The away side found themselves down 2-4 at the start of the doubles, but immediately hit back by winning the first of them. However, Out Back wrapped up the point by winning the next game, which was a long tactical grind that frequently swung in both side’s favor. The Wall capitalized fully on Blue Sky Bar’s slip-up by promoting themselves into second position with a comfortable win over Enjoy Place. 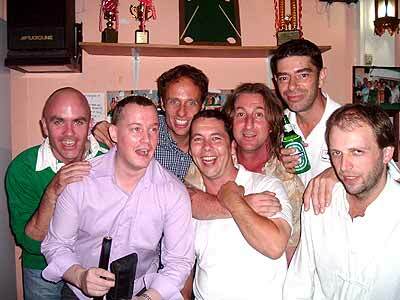 And reigning Champions, The Local, showed the kind of form that landed them the title. They had an unassailable lead of 5-1 at the break and went on to rout Rock Hard Bistro 7-2.
side by scratching on the black. Elsewhere, La Villa overcame Friend’s Corner 5-4 in a mid table encounter, and winners Blue Sky Garden, 4-2 up at the break, never looked in trouble against December Bar. When pool players start missing the easy ones, they usually put it down to lack of concentration, practice or energy. But failing to line up shots with the dominant eye could be the reason. on the object not your thumb. Therefore, the shaft of the cue should be in line with your dominant eye when playing a shot. Some neck and stance adjustments might be necessary for cross-dominant players and ambi-oculars should line shots with their nose. with your eyes closed – forget it.